Compared to 10BASE2 and 10BASE5, hubs solved some cabling and availability problems. However, the use of hubs allowed network performance to degrade as utilization increased, just like when 10BASE2 and 10BASE5 were used, because 10BASE-T still created a single electrical bus shared among all devices on the LAN. Ethernets that share a bus cannot reach 100 percent utilization because of collisions and the CSMA/CD arbitration algorithm. To solve the performance problems, the next step was to make the hub smart enough to ensure that collisions simply did not happen—which means that CSMA/CD would no longer be needed. First, you need a deeper knowledge of 10BASE-T hubs before the solution to the congestion problem becomes obvious. Figure 3-9 outlines the operation of half-duplex 10BASE-T with hubs. 1. The network interface card (NIC) sends a frame. 2. The NIC loops the sent frame onto its receive pair internally on the card. 3. The hub receives the frame. 4. The hub's internal wiring propagates the signal to all other ports, but not back to the port that the signal was received upon. 5. The hub repeats the signal to each receive pair to all other devices. The figure details how the hub works, with one device sending and no collision. If PC1 and PC2 sent a frame at the same time, a collision would occur. At Steps 4 and 5, the hub would forward both electrical signals, which would cause the overlapping signals to be sent to all the NICs. So, because collisions can occur, CSMA/CD logic still is needed to have PC1 and PC2 wait and try again. 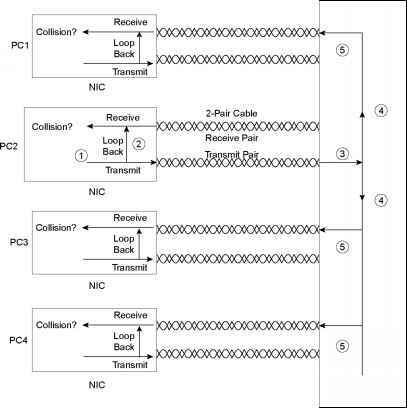 NOTE PC2 would sense a collision because of its loopback circuitry on the NIC. The hub does not forward the signal that PC2 sent to the hub back to PC2. Instead, each NIC loops the frame that it sends back to its own receive pair on the NIC, as shown in Step 2 of the figure. Then, if PC2 is sending a frame and PC1 also sends a frame at the same time, the signal sent by PC1 is forwarded by the hub to PC2 on PC2's receive pair. The incoming signal from the hub, plus the looped signal on PC2's NIC, lets PC2 notice that there is a collision. Who cares? Well, to appreciate full-duplex LAN operation, you need to know about the NIC's loopback feature.